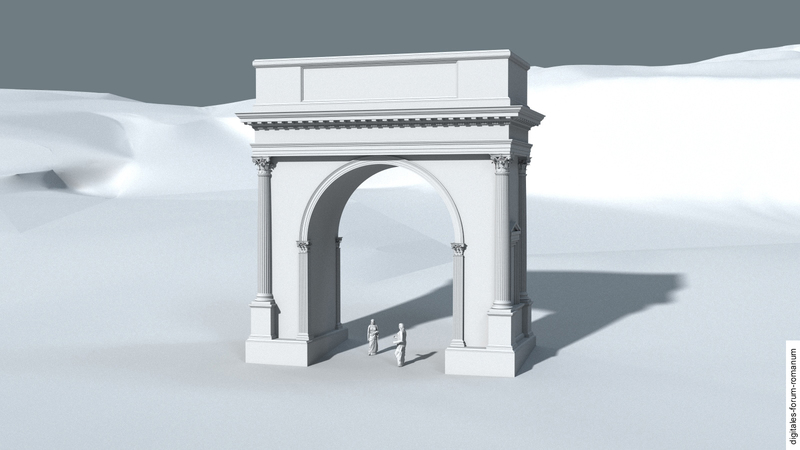 The honorific arch that Augustus received for his victory at Actium heralded the start of a completely new approach to the construction of honorific arches on the Forum. Thus it poses a special problem for scholars who are investigating the Forum under Augustus that the exact location of the Actian Arch has not yet been determined and that no fragments have been ascribed to it. The discussion of this monument is based upon secondary sources, literary works and the depiction of the arch on a contemporary coin. This alone shows that the erection of this arch must have been a sensation, back when the Forum was built. The novel thing about the Actian Arch was that it was conspicuously decorated as a monument for the celebration of a military triumph. This effect was mainly achieved by setting a triumphal quadriga on top of the arch. Herein lay a decisive difference between this arch and older Republican arch monuments, such as the Fornix Fabianus at the Forum. Before the battle at Actium, victorious generals and admirals were honoured through the erection of honorific statues and columns (sometimes decorated with naval rams; see Columnae rostratae of Augustus; Comitium). Moreover, the victorious triumphators donated their spoils – such as the rams of the defeated fleets or their enemies’ shields – as decoration for the structures on the Forum (see e.g. Rostra Augusti; Tabernae) in order to showcase their military victory. However, the erection of an arch monument in order to explicitly commemorate a triumph was a sensational novelty in the Forum. This makes it clear how rigorously the ideological celebration of the victory at Actium was planned. Octavian continued a tradition which had been practised since the middle Republic, namely, erecting honorific monuments on the Forum for individuals who had been victorious in battle. However, he was the first to link the honorific arch closely to the triumphal celebration. The great significance of this honorific monument is attested by the fact that its erection was ordered by the Senate: that is, the Senate officially sanctioned and legitimised Octavian’s victory in the civil war – and this act of legitimisation was visible in permanent form to everybody in the Forum. By prevailing over Marc Anthony and the Egyptian queen Cleopatra in 31 B.C. at Actium and turning Egypt into a Roman province in the following year, Octavian ended the civil wars and attained sole rule in Rome. He thereby secured the grain supplies and was able to reward his soldiers plentifully. For this he received a triumph over Cleopatra and a triumph for the subjugation of Egypt. In addition, the Senate honoured him through two honorific arches, one in Brundisium, the other in the Forum Romanum in Rome. It was in Brundisium, at the end of the Via Appia, that Octavian first stepped on to Italic soil after his victory at Actium. The unpleasant fact that Octavian had not only fought against the Egyptian queen at Actium but against the Roman troops of Marc Anthony was eradicated from public memory through a neatly planned triumphal celebration. In 29 B.C. Augustus staged a triple triumph over Dalmatia (37 – 35 B.C. ), Actium (31 B.C.) and Egypt (30 B.C. ), whereby the third triumph – in celebration of Egypt becoming a province – constituted the high point of the festivities (which lasted for three whole days). Accordingly, the third triumph clearly eclipsed the two preceding ones in terms of the exhibition of spoils and prisoners of war. By conjoining all three triumphs, Octavian sought to integrate his victory over Marc Anthony into a larger narrative lauding Octavian’s protection of Rome against external enemies. Therefore it is plausible that the Actiumbogen, which was built in the Forum by the Senate in honour of Octavian, did not portray a victory in the civil war, but (just as the triumphal festivities) celebrated a victory over external enemies. The interpretation of the battle of Actium as a victory over the Egyptian queen Cleopatra, together with the annexation of Egypt, constituted a twofold win over the external enemy Egypt. And in order to distract from this slight of hand, Octavian ignored the usual practice and named his victory not after the people that were defeated, but after the place at which the decisive battle had been fought – ex Actio and ex Aegypto. This also illustrates the innovative strategies that were devised in order to cleanse the victory monuments from the blood of the civil war. The exact location of the Actian Arch is open to debate. The literary sources merely mention the Forum Romanum as the location. 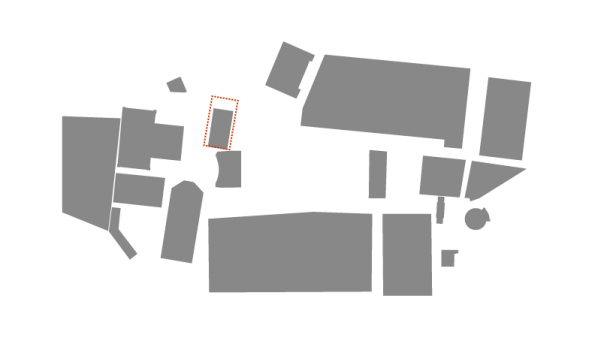 Various sites in the Forum are possible – while the topography makes certain locations, such as the area at the Comitium or the new speaker’s platform, seem more plausible than others. It should also be noted that no traces of the arch have yet been discovered, which should direct our focus to those areas which have not yet been excavated. On the basis of these considerations, our preliminary suggestion is to situate the Actian Arch at the north-west corner of the Forum, near the Comitium, the Rostra Augusti and the Curia. This location seems to be highly suited to the erection of an arch monument honouring the naval victory at Actium, for several reasons. Firstly, the area around the Comitium had always been the most prominent space in the Forum and naturally amassed a host of honorific monuments. Here Augustus’ monument would have been able to engage in dialogue with the older, Republican victory monuments which still stood there, especially those that also commemorated naval victories, such as the Columna rostrata of Duilius or the rams of Antium and later naval victories which were exhibited on the Rostra Augusti. Secondly, this area was especially attractive in light of the traditional festivals: it was an old custom that the route of the triumphal procession went past this area south of the Comitium. Thus Augustus’ victory and triumph would remain visible in all the processions that were held after it. Thirdly, Augustus had specifically exploited the adjoining Curia by erecting statues and displaying his spoils from Egypt there – a demonstration of his victory at Actium and his supremacy in Rome. An alternative account of the location of the Actian Arch that has been put forward by some scholars goes as follows: The arch once stood at the location of the later Parthian Arch, south of the Temple of Caesar, but was either taken down when the Parthian Arch was erected or integrated into the new Parthian Arch. However, this hypothesis is based on a misinterpretation of the foundation remains east of the Parthian Arch and thus was rejected. A particular Roman coin from the period between 29 – 27 B.C. portrays an arch (with one portal) which can be identified as the Actian Arch. Especially striking in this depiction is the emphasis on the quadriga and the triumphator on top of the arch. Flying Victories appear on the pendentives. The pillars of the arch display circular tondi. All of this indicates that the arch was richly decorated with sculpture. However, reconstructing the Actian Arch solely on the basis of a depiction on a coin can only produce a hypothetical result. Thus it seems more helpful to compare it to other arch monuments from the late Republic and early Imperial Period in order to ascertain approximate proportions and overall composition. Using this method we produced the reconstruction seen in the model. A more nuanced reconstruction is not possible so long as no further foundations, architectural remains or ornaments are ascribed to the arch. S. De Maria, Gli archi onorari di Roma e dell’Italia Romana (Rome 1988) 267-268. E. Nedergaard, Zur Problematik der Augustusbögen auf dem Forum Romanum, in: M. Hofter (ed. ), Kaiser Augustus und die verlorene Republik. Eine Ausstellung im Martin-Gropius-Bau, Berlin, 7. Juni – 14. August 1988 (Berlin 1988) 224-239. E. Nedergaard, Arcus Augusti (a. 29 a.C.), in: E.M. Steinby (ed. ), Lexicon Topographicum Urbis Romae I (Rome 1993) 80-81.